The first LNG Cargo under the long-term contract between GAIL and Gazprom Marketing and Trading Singapore (GMTS) of Russia arrived today at the LNG terminal of Petronet LNG Ltd (PLL) in Dahej, Gujarat. The LNG vessel “LNG Kano” carried 3.4 TBTU of LNG. The LNG cargo was received by Minister of Petroleum & Natural Gas and Skill Development & Entrepreneurship Dharmendra at an event here in Dahej. The first LNG Cargo under the long-term contract between GAIL and Gazprom Marketing and Trading Singapore (GMTS) of Russia arrived today at the LNG terminal of Petronet LNG Ltd (PLL) in Dahej, Gujarat. The LNG vessel “LNG Kano” carried 3.4 TBTU of LNG. The LNG cargo was received by Minister of Petroleum & Natural Gas and Skill Development & Entrepreneurship Dharmendra at an event here in Dahej. Russian Trade Commissioner in New Delhi and other senior officials of Gazprom were present in the event. Speaking on the occasion, Dharmendra Pradhan said that the starting of LNG imports from Russia has added a new dimension to the Indo-Russian bilateral relations, particularly in the oil and gas sector. He added that Prime Minister Modi and President Putin have placed special emphasis on energy cooperation between the two countries, which has taken shape of an Energy Bridge between the two countries. Today’s arrival of first LNG cargo from Russia is an example of this growing strategic partnership. Russia has emerged as a long-term source for India’s hydrocarbon imports. Union Minister Dharmendra Pradhan added that LNG imports from Russia will go a long way in mitigating the risks arising out of geo-political uncertainties. He mentioned that government is committed towards transforming India into a gas-based economy. To realize this aspiration, investments are being made for augmenting natural gas infrastructure, including pipelines, LNG import terminals and City Gas Distribution networks. 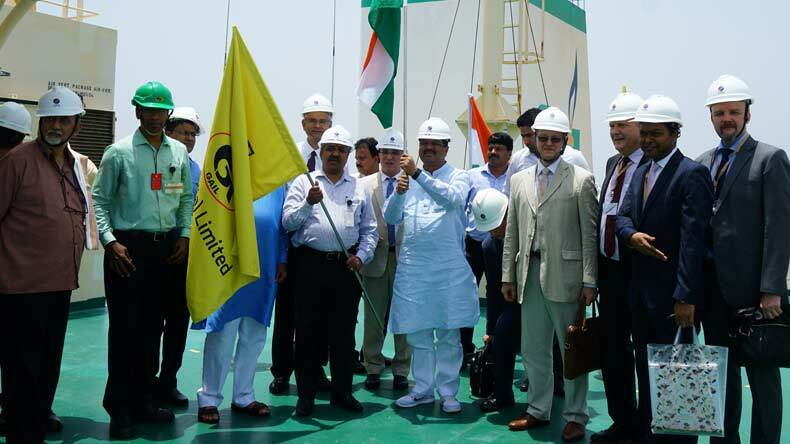 GAIL became the first Indian public-sector company from India to source LNG from Russian side on a long term. It has contracted to import 2.5 MMTPA of LNG from Gazprom Marketing and Trading Singapore’s (GMTS) on a long-term basis. In the last few years, Indian companies have made the investments of more than US $ 10 billion in acquiring varying stakes in strategic Russian projects Sakhalin-1, Vankorneft and Taas-Yuryakh. On the other hand, Russian company led consortium has committed an investment of US $ 13 billion in Essar Oil in 2016. Russia is currently, world’s largest crude oil and second largest gas producer in the world, while India is world’s 3rd largest energy consumer & 4th largest import of LNG. Russia has potential to be a significant supplier for Indian hydrocarbon demand in the coming years.